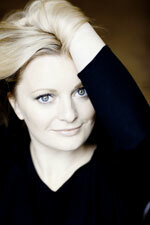 Born in Staffordshire, Lucy studied at the Royal Academy of Music, where she has recently been appointed a Fellow. Lucy has established herself as one of the leading lyric sopranos of her generation. With repertoire ranging from Purcell, Handel and Mozart to Donizetti’s Adina and Verdi’s Gilda she has sung with opera companies throughout the world, including the Royal Opera, the Glyndebourne Festival, English National Opera, the Teatro Real Madrid, the Deutsche Oper Berlin, the Bavarian State Opera and the Metropolitan Opera. In concert, she has performed with many of the world’s finest conductors and orchestras including the Los Angeles Philharmonic under Dudamel, the Boston Symphony Orchestra under Nelsons, the Accademia Santa Cecilia Orchestra under Pappano, the Berliner Philharmoniker under Rattle, the Orchestre National de France under Gatti, the Philharmonia under Salonen, the London Symphony Orchestra under Harding and Elder, the City of Birmingham Symphony Orchestra under Gardner, the Budapest Festival Orchestra under Iván Fischer, the Zurich Chamber Orchestra under Sir Roger Norrington, the Orchestra of the Age of Enlightenment under Sir Charles Mackerras, and the Monteverdi Choir and Orchestra under Sir John Eliot Gardiner. 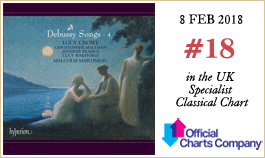 Lucy has performed at the BBC Proms and the Aldeburgh Festival, the Edinburgh International Festival, the Mostly Mozart Festival in New York, and at the Salzburg Festival. Recital appearances include London’s Wigmore Hall, New York’s Carnegie Hall and Amsterdam’s Concertgebouw. Née dans le Staffordshire, Lucy Crowe a fait ses études à la Royal Academy of Music, où elle a récemment été nommée Fellow. Avec un répertoire qui va de Purcell, Haendel et Mozart à Adina de Donizetti et Gilda de Verdi, elle a chanté avec des compagnies lyriques à travers le Royaume-Uni et l’Europe, notamment le Royal Opera, Covent Garden, le Festival de Glyndebourne, l’English National Opera, le Deutsche Oper de Berlin et l’Opéra d’État de Bavière. Elle a fait ses débuts lyriques aux États-Unis en Iole dans Hercules de Haendel pour le Chicago Lyric Opera, reprenant le rôle pour la Canadian Opera Company, et s’est produite pour la première fois au Metropolitan Opera de New York en Servilia dans La clemenza di Tito, avant de revenir en Adele dans Die Fledermaus. En concert, elle est très sollicitée par les grands orchestres et chefs du monde entier, et a chanté aux festivals d’Aldeburgh, Édimbourg, Salzbourg et Tanglewood, ainsi qu’au Mostly Mozart Festival de New York. Elle est régulièrement l’invitée du Wigmore Hall de Londres, et a également donné des récitals au Carnegie Hall de New York et au Concertgebouw d’Amsterdam. Lucy Crowe, in Staffordshire geboren, studierte an der Royal Academy of Music, an der sie kürzlich zum Fellow ernannt wurde. Ihr Repertoire erstreckt sich von Purcell, Händel und Mozart bis zu Donizettis Adina und Verdis Gilda. Sie hat in ganz Großbritannien und auf dem europäischen Festland gesungen, an der Royal Opera, Covent Garden ebenso wie beim Glyndebourne Festival, an der English National Opera, der Deutschen Oper Berlin und der Bayrischen Staatsoper. Ihr Operndebüt in den USA bestritt sie mit der Rolle der Iole in Händels Hercules an der Chicago Lyric Opera, ein Part, den sie mit der Canadian Opera Company wieder aufnahm; bei ihrem Debüt an der Metropolitan Opera in New York sang sie die Servilia in La clemenza di Tito, als Adele in Die Fledermaus kehrte sie an das Haus zurück. Auf der Konzertbühne ist sie gefragt bei namhaften Orchestern und Dirigenten, Gastauftritte absolvierte sie bei den Festspielen in Aldeburgh, Edinburgh, Salzburg und Tanglewood sowie beim Mostly Mozart Festival in New York. Regelmäßig ist sie auch in der Wigmore Hall in London zu Gast, zudem trat sie in der Carnegie Hall in New York sowie im Concertgebouw in Amsterdam auf.